I'm fairly certain I've fallen in love - with an ice-cream parlour. 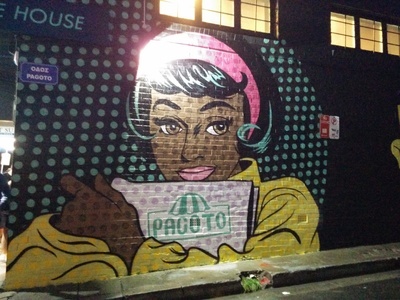 Pagoto Gelato & Waffle House (Pagoto is Greek for ice-cream) officially opened on Marrickville road on Friday 13th Feb, launching the night before. This place is a bit of a 'hole-in-the-wall,' with the counter taking up almost half the space and the store only made smaller by the sheer number of people trying to crowd inside to browse or place orders. This is not a place for the faint-hearted or claustrophobic. 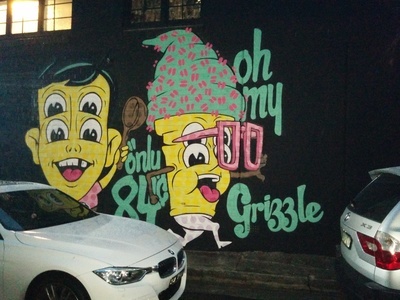 You know a place is trendy and cool when the wall art looks like this. The décor in the shop combines black, a soft minty green, and accents of raw, unfinished wood, which, along with the simple blackboard menu and ice-cream themed graffiti artwork, give the whole place a young, cool, edgy vibe. Getting in the door, placing our order and actually finding somewhere to enjoy our ice-cream was a bit of a mission, but once that was done, it was great. The number of flavours on offer is extensive. There are over thirty-six flavours, but I swear it seemed like so much more. Some are fairly common; lemon sorbet and cookies and cream, while others are more unique with a distinct Greek vibe; affogato tsoureki, diples, baklava, fetta and watermelon, peaches and raspberry, french vanilla, lychee coconut, passionfruit cheesecake - I could go on, and on, but I won't list them all and ruin the surprise. The creamy soft swirls of ice-cream are topped with their namesake (so you know exactly what you're getting) and they all look amazing. 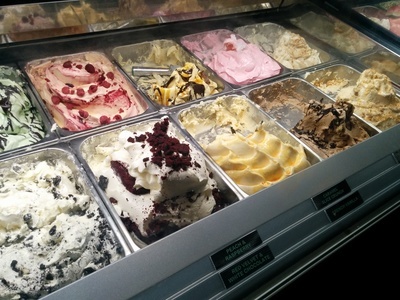 The huge range of gelato in this shop looks absolutely delicious and spells trouble for the indecisive. With those specialty ice-cream prices which manage to get you to buy just one more scoop for just a little more, it's easy to get carried away (1 scoop: $5.00, 2 scoops: $6.50). Of course to write a decent review I had to try as much as possible, which meant I just had to visit my paramour two days in a row... such a shame. Generally speaking all the ice-cream is creamy and light. There is however some variation in texture depending on the flavour. If you like your classics, the French vanilla is tastier than should be allowed for vanilla and has real vanilla bean seeds through it, while the honeycomb has a subtle natural honey flavour. For the lovers of tangy flavours, the guava and pineapple is very good. The sorbet is tangy and refreshing with the subtle pineapple playing second fiddle to the guava. Adventurous people should take a chance with the caramelised fig and ginger, baklava, fetta and watermelon or really any of the other Greek inspired, or more unusual flavour combinations. If you can't figure out what something is, ask the staff for a little help, or just take a risk, be surprised and hope you like it. The best ice-cream is on Ice-Cream Street. The caramelised fig and ginger packs quite a ginger punch, so if you aren’t a ginger fan, this probably isn’t for you. The baklava tastes exactly like its namesake, except smoother and creamier, while the watermelon and fetta is unusual and unexpected. It’s still creamy, except with crumbs of fetta mixed through the smooth ice-cream, and the sweet watermelon and salty fetta make for a surprisingly well balanced delight. 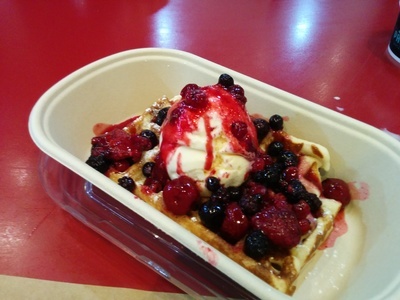 A freshly made, delicious mixed berry waffle, with a scoop of creamy French vanilla ice-cream. Don’t think you’ll miss out on ice-cream if you get just a waffle as each waffle comes with a generous scoop of creamy French vanilla. The waffles ($12.50 each) are light and fluffy and full of flavour and come with a variety of toppings - these are my new favourite waffles. With delicious ice-cream and waffles and helpful service, the only real problem with Pagoto is that there is very limited seating - there is only one table and a long, thin bench. While there are tubs of ice-cream available to take away, it's just not quite the same. Where: 301 Victoria Rd, Marrickville, 2204. Cost: $5 - $12.50 pp.